Where Does Dance Live in Our Society? Dance is everywhere, dance is anywhere, yet, dance is nowhere. I have been musing on the place dance holds in our society and in our cultural landscape. Television is filled with dance images more so than ever -- programs such as "So You Think You Can Dance" and "Dancing with the Stars" are popular with dancers and non-dancers; I can't remember the last time I saw a commercial that did not have dance imagery included in a scene. In the Bay Area, the San Francisco Ballet is the oldest professional ballet company in America. Yet, those of us entrenched in dance education know that the joy, hope and beauty that is experienced viewing dances and creating dances is generally limited to the middle and upper classes. Arts education in the California public school system demonstrates a large equity gap -- only 16 percent of public school students from low-income households experience quality standards-based arts education, compared to the 84 percent of students from moderate to upper income households who receive rigorous arts instruction.1 This equity gap widens when you factor in the dance arts--with only .3 percent of children in our state enrolled in a school-based dance course.2 This means 99.7 percent of children do not receive the benefits a dance education can bring. At Luna Dance Institute, we work toward filling this gap by bringing teaching artists into schools. However, I know that we are making a small dent in a humongous hole. It saddens me that as a society we lack the will to ensure that dance is part of the cultural fabric that each child experiences. Every day, at Luna, we witness the nourishment dance brings into children's lives. ALL children NEED dance. 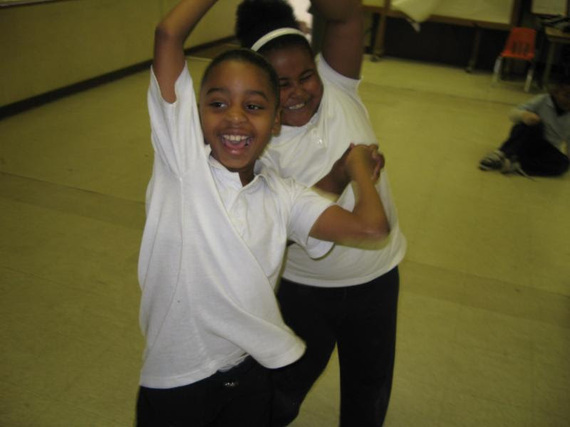 Current research provides evidence that dance supports empathy, problem-solving, curiosity, and physical development. These are all attributes needed to thrive in our 21st century culture. Dance cultivates the body, mind and soul. As humans we are compelled to create, to play, to love and to communicate through movement -- after all, gesture was our first language. Dance gives us life and brings us joy and hope. Just this morning I was visiting one of our school programs at Grass Valley elementary school in Oakland, where 80 students grades kindergarten through 5th grade were dancing together for the year-end peer share. The dance program at this school is experienced by both the general education students and students with special needs. The peer share event gave all students an inclusive learning opportunity. All 80 children did their Brain Dance™ warm-up together, and then each of the classrooms performed a dance they had choreographed with their teaching artist. I witnessed creativity, lots of smiles, laughter, classroom teachers and teaching artists boogieing with their students, children moving in connected body shapes, an incredibly large group of students respecting each others' personal space while dancing together. The event ended with dancers leaping across the multi-purpose room to Pharrell William's song, "Happy". When asked why dance was important to him, a child in one of our East Oakland school programs said, "Dance has made me change my life and experience what life is about through dancing." My wish is that all children in California schools have this life-changing experience. Learn more about Luna Dance Institute at www.lunadanceinstitute.org.